Posted on July 1, 2015 at 4:37 pm. “Squaring the circle”* has been a challenge for geometers for centuries. This challenge was my inspiration for “Squaring the Round” — a new game of skill. Arrange boxes around the cylindrical container until a desirable fit has been achieved. Avoid creating a space large enough for the ball to slip through. Measure the height of the cylindrical container. Use this measurement for the height of the boxes; mark and cut. Using tape, cover the cut edges of the boxes. Place boxes in predetermined arrangement around the cylindrical container. Tape together where possible. Using marker assign points to each section. Wad newspaper into a ball. Wrap with tape. In an open area set target on the floor or ground. Determine the distance from which the ball or bean bag is to be thrown. *The objective of “Squaring the Circle” is to construct a circle, calculate its area, and then construct a square with the same area using only a compass and straight edge. Posted on June 1, 2015 at 4:35 pm. – Remove the bottom of the plastic jug. – When you are happy with the shape of the scoop, cut. 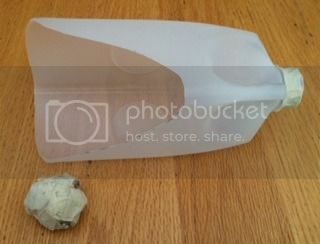 – Wrap several layers of tape around the spout to secure the lid. – Repeat with the second plastic jug. – Make your own Tape Ball by wadding newspaper into a ball. Wrap with masking tape. Using only the scoop, toss and catch the ball between players. For added fun, form teams and play versions of baseball, football, lacrosse, or hockey using the scoops. Posted on May 8, 2015 at 4:34 pm. Ahhhh spring! Spring brings a different set of outdoor activities to enjoy: 4-Square, hopscotch, ball hockey, marbles, tirar frijoles, circle tag. Make sure you are ready with your custom made sidewalk chalk. In the plastic container mix ½ cup plaster of paris and ¼ cup corn starch. Slowly add ¼ to ½ cup water while stirring with the craft stick. Add tempera paint until the desired color is achieved. Put mixture into prepared toilet paper tube. Set the tube upright (waxed paper side down) on a plastic lid or newspaper until it hardens – generally overnight. Once it hardens/dries, peel off the paper tube. It is now ready to use! IMPORTANT: Do NOT rinse cup in the sink!! This stuff hardens and will clog sink! Posted on April 1, 2015 at 4:33 pm. 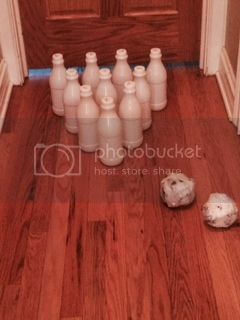 This version of a ball-n-cup game was created by nine-year-old Lily, who was an attendee at a summer play table. To Make: Punch a hole just below the lip/rim of a clean yogurt cup. Directly across, punch a second hole. Take one piece of string, thread it through one hole and tie a knot to secure one end on the cup. Do the same with the other piece of string and other hole. Put the non-tied end of the string in the middle of one piece of foil; wad/crunch the foil into a ball with the string inside. Do the same with the other string. To Play: Hold the cup in one hand and try to flip both foil balls into the cup. Posted on February 8, 2015 at 4:32 pm. 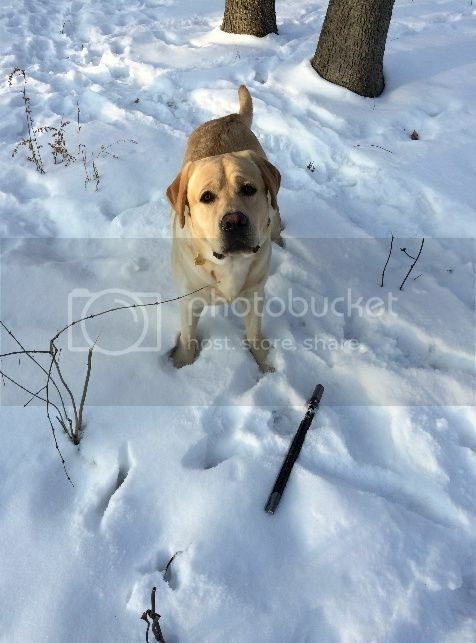 Once again this year, Sundance, my Labrador, offered to do the “Playing from Scratch” activity for the upcoming month while I was at the Value of Play Conference. Being the retriever that he is, this activity is one of his favorites and thus he had to share. Thank you Sundance for your assistance with this month’s activity. To make: put the cardboard tubes side by side. Wrap tightly with duct tape. To Play: Tell the human you need to go outside. On the way outside, pick up the fetch toy. When outside, drop the toy by the human’s feet, run a few yards, turn to look at the human, and smile. Hopefully the human will understand, pick up the fetch toy, and throw it. From here you know what to do. Posted on January 1, 2015 at 4:31 pm. Toss ‘snowballs’ and ‘ice balls’ through a snowman shaped target. 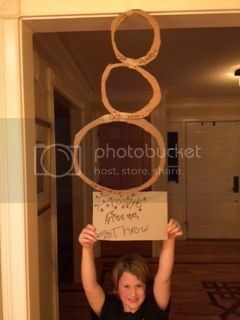 Make three rings out of cardboard. On a large piece of cardboard (e.g., 15”x15”) make a big circle. Cut out the circle. Make another circle 1-inch inside the big circle creating a one-inch ring. Cut out the little circle inside that big circle. Now you have a large ring. Using a hole punch, make one hole in the cardboard ring. Next to the hole write: “10 points”. Set aside the large ring (Ring #1). On a medium size piece of cardboard (e.g., 12”x12”) make a circle. Cut out the circle. Make another circle inside this circle creating a one-inch ring. Cut out the little circle inside that circle. Now you have a medium ring. Using a hole punch make a hole in the cardboard ring; directly across the diameter make another hole. Next to one of the holes write: “50 points”. Set aside the medium ring (Ring #2). On a smaller piece of cardboard (9”x9”) make a circle. Cut out the circle. Make another circle inside this circle creating a one-inch ring. Cut out the little circle inside that circle. Now you have a small ring. Using a hole punch, make one hole in the cardboard ring. Next to the hole write: “100 points”. Using a piece of string connect the small ring to the medium one. To do this put the string through the hole in the small ring and one of the holes in the medium ring. Tie a double knot; cut excess string. Then connect the medium ring to the large ring using the same technique. If you would like, add arms by wrapping a pipe cleaner on each side of the middle ring and then letting it stick out to the side. Bend each pipe cleaner to resemble a tree branch. 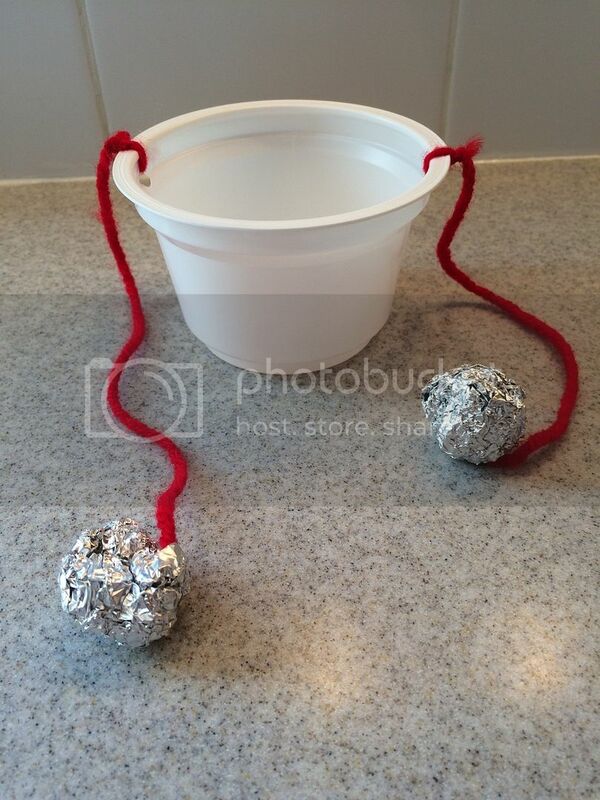 Throw ‘ice ball’ (wad of aluminum foil) and ‘snow ball’ (pom pom) through the hoops. Challenge your family and friends to see who can score the most points. Posted on December 1, 2014 at 4:30 pm. There are MANY recipes for play dough. Personally, I prefer dough that does not smell like something I want to eat (e.g., chocolate pudding, orange sherbet, peanut butter). I also prefer the texture of a cooked or heat processed dough. Below are two recipes: one that uses wheat flour (gluten) and the other rice flour (gluten free). In a pot combine all the dried ingredients, oil, and water. Cook over medium heat while constantly stirring. After 3-4 minutes the dough will begin to form a ball and pull away from the sides of the pan. Remove from heat. When dough is cool enough to handle turn out onto a flat surface and knead. If you want colored dough, knead in food coloring. If dough is sticky, knead in a little flour or cornstarch. Store in airtight container. Source: I don’t have a reference for this recipe. It was handwritten on a piece of paper and given to me 25 years ago by a preschool teacher. In a pot combine all the dried ingredients, oil, and hot water. Cook over medium heat while constantly stirring. After 3-4 minutes the dough will begin to form a ball and pull away from the sides of the pan. Remove from heat. When the dough is cool enough to handle turn out onto a flat surface and knead. If you want colored dough, knead in food coloring. If the dough is sticky knead in cornstarch or arrowroot until you reach the desired consistency. Note: Dough will be less sticky when cool. Store in airtight container. Posted on November 1, 2014 at 4:28 pm. 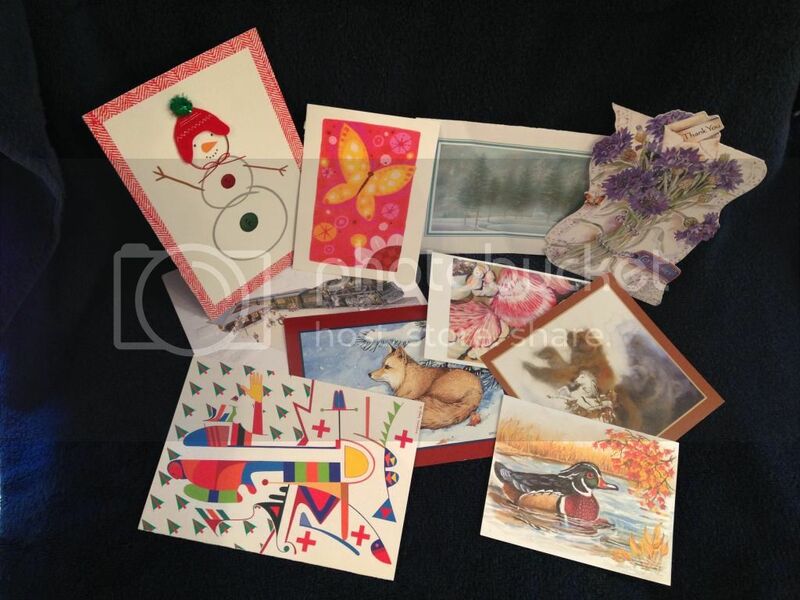 The front covers of used greeting cards are perfect for games and activities. Place a stack of card fronts face down on the table. Each player selects three cards and creates a short story that incorporates elements from his/her cards. Players go around the table sharing their story. Or play cooperatively whereby the first player turns over a card and starts a story based on the images from that card. The second player then flips over the next card and must continue the same story, but now incorporating elements from the new card. Play continues until cards run out or the story reaches a natural end. Place a stack of card fronts face down on the table. Each player selects three cards, carefully studies the designs, and identifies the ways in which his/her cards are alike. Once everyone has taken a turn, collect all the cards, shuffle, and begin again. Or start by selecting two cards and placing them face up on the table. Go around the circle and each person identifies how the two cards are similar. If a person cannot point out a similarity s/he is out. Once everyone has spoken, select another card and place it face up next to the first two. Again, go around the circle and have each person identify how the cards are alike. Keep adding cards and finding similarities among all the face up cards until there is only one person remaining. Oh No! There’s a Hole! Posted on October 1, 2014 at 4:27 pm. Players take turns snipping a net with the hopes that their snip is not the one that lets the ‘fish’ get away. Bottle caps, jingle bells, caps off squeeze applesauce pouches, etc. Stretch the netting over the can. Secure in place with rubber band. Players take turns snipping the net. Game ends when all the items have fallen into the can. Posted on September 1, 2014 at 4:25 pm. BALL: Wad the newspaper into a sphere and wrap with tape. PINS: Fill each bottle with about 1-inch of water, sand, pebbles, or dirt. Select an area that is safe to roll a ball and to retrieve pins. Set up the pins in a triangular fashion: 4 pins in the back row, 3 in the row in front of that, 2 in the next row up, and then 1 in the front. Take several steps back and try to knock down all the pins by rolling the ball. To change things up a bit …. Use plastic bottles of different sizes. Place number values on each pin, from 1 to 10. Start by arranging the pins in consecutive order with the front pin being 1 point and the pins in the last row getting 7, 8, 9, and10 points. Calculate your score by adding the numbers on the pins that have been knocked down. For the next game, rearrange the pins so the numbers are not in consecutive order.